Sen. Tom Cotton (R., Ark.) applauded President Donald Trump's proclamation concerning asylum for migrants who illegally cross the Mexican border into the United States. "I applaud the administration’s efforts to fix our broken asylum system. Individuals with valid asylum claims should apply in their home countries or a safe third country, not by showing up at our border. We will not let anyone take advantage of America’s generosity by exploiting loopholes in our immigration system. 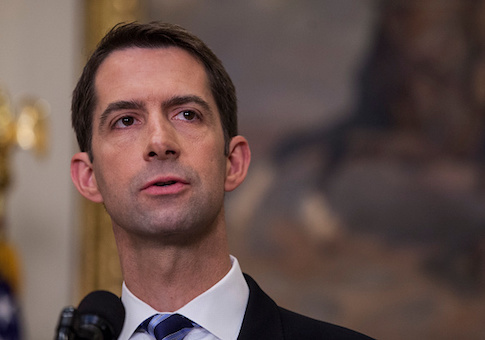 Congress should also act to codify these common-sense reforms," Cotton said in a statement. Earlier today, Trump signed a proclamation denying asylum to migrants trying to cross the border illegally, outside ports of entry. The policy was announced at least partly in response to caravans of migrants approaching the United States. As many as 8,000 migrants are traveling toward the U.S. southern border in two caravans, according to estimates compiled by Politifact. The caravan that has traveled farthest north through Mexico is estimated to include at least 3,500 people. "People can come in, but they have to come in through the ports of entry, and that, to me, is a very important thing," Trump said on Friday. "We're not letting them in, but they're trying to flood our country. We need the wall." "The laws are obsolete, and they're incompetent," Trump added. "They are the worst laws any country has anywhere in the world, and it's only because we don't have the Democrats' votes." The new restrictions will initially be in place for three months but may be renewed. They will likely be challenged in court by Democrats and immigrant rights organizations. The Trump administration is justifying the restrictions based on parts of the Immigration and Nationality Act of 1965, which permit the president to deny entry to immigrants to protect national security. "I reiterate we need Democrats' votes. They have to pass new immigration laws because they’re flooding our country. We’re not letting them in, but they’re trying to flood our country," Trump said. This entry was posted in National Security and tagged Donald Trump, Illegal Immigration, Immigration, Tom Cotton. Bookmark the permalink.